Hey everyone, Wojtek here from Rumble. Many people were inquiring, so I felt I should provide a little explanation on what “Rumbling” means on your Pending Videos page. After uploading and selecting your licensing option, videos get placed into a queue. In this queue an automated technology dubbed ‘Rumble Rank’ makes a decision on the value and virality of the content you uploaded, and if our Rumble Rank ‘likes’ the content, it will be sent to our newsroom for a final decision and audit. If for any reason Rumble Rank and/or editors are not certain (possibly due to not enough data) but they see potential value in your content,it will get placed into a separate queue called ‘Rumbling’. At this point your chances are pretty good that it will get purchased/approved, but still not certain. Most people can expect a reply within two weeks while rumbling, in some cases this can take longer. Upload the highest quality video you can. Cut any lead up / part of the clip that is not needed. Over the holidays, a part of our Rumble team was hard at work! They managed to push live the latest version of our Windows 8 desktop application. If you are using your surface, desktop or any windows tablet, you will definitely like what our latest update has too offer. 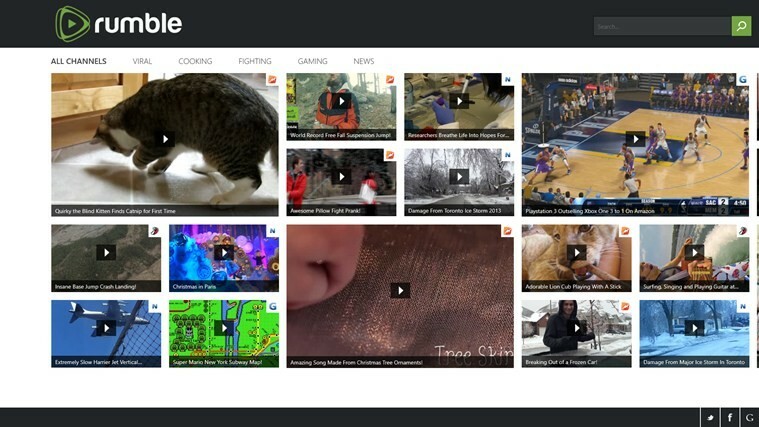 In addition to fixing bugs, the rumble team created a new user interface, added new categories of video content, and streamlined the uploading process. Most importantly, the tweak to the user interface was the most important update in our 4th version of our Windows application. You’ll notice the design uses the universal elements seen on our website, and maintains the full overall look and feel of rumble. We also made sure the upload process mimicked the web version, creating less confusion for all of our video creators. In addition, we want to give a big thanks to the folks at Microsoft for helping us in the development process of this application. Their team really helped us get this app through the door and out to all of our Windows users.